When people mention bills, we immediately think about the money that goes out every month so we can have a roof over our heads and take care of ourselves and our families. But there’s another kind of bill, one that subsequently becomes law and affects large segments of the population. Legislative bills dealing with kidney disease can improve our lives and the lives of the many thousands of people who will face renal failure in the future. Part of the work of the Renal Support Network is to monitor and help pass legislation that affects people with kidney disease. Here are three stories that illustrate what certain types of legislation could mean to you and those you love. 1Today is March 10: It used to be Vera’s favorite day, but now it’s a very sad one. Three years ago today, Vera got her kidney transplant. Over those three years, she hasn’t been able to find full-time employment, only part-time jobs with no health insurance. Today she received a letter informing her that her Medicare benefits are ending; she’s reached 36 months of post-transplant coverage. Her medications cost $600 a month; without the help that Medicare provides, she can’t imagine how she’ll pay for them. If she can’t find a way, rejection will set in, and she’ll lose her kidney. Any one of us could be Vera. But this kind of loss is avoidable. The Comprehensive Immunosuppressive Drug Coverage for Kidney Transplant Patients Act is a bill that amends the Social Security Act to extend the Medicare coverage of immunosuppressive drugs for the life of a transplanted kidney. 2Even when she was very small, Kristi loved science. Now she’s a college student who dreams of one day curing people. She’d be a great doctor, but she’s more interested in doing research on disease and treatment. When she was young, her favorite uncle died of kidney failure caused by high blood pressure and cardiovascular complications. She’d like to study the long-term effects of high blood pressure on the kidneys. As she prepares for graduation, she’s looking for an internship in the field of kidney research, but she isn’t finding many options. There are a lot of research jobs, but not many centered on renal failure. She decides to take a job with the Institute for Cardiac Health, her second area of interest, instead. The renal community just lost a possible trailblazer. 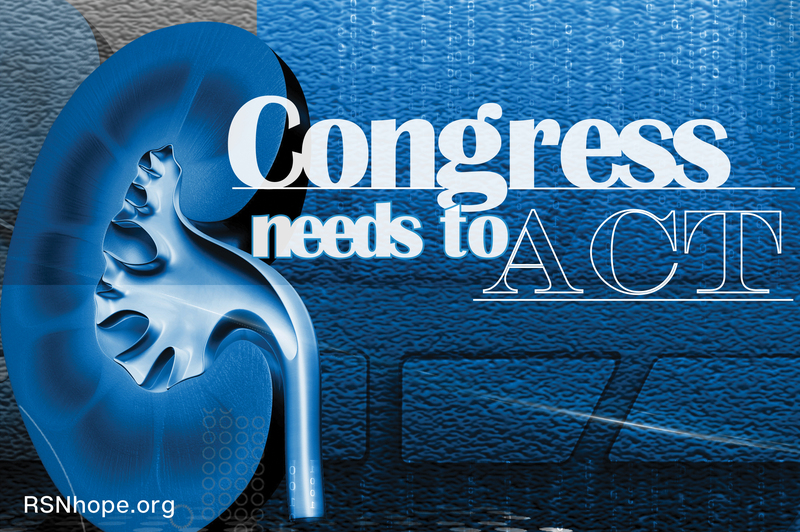 The Chronic Kidney Disease Improvement in Research and Treatment Act was introduced to provide for more renal research. The bill will ask Congress to produce a report showing the disparity between how much money is spent on caring for people with kidney failure and how much is spent on research into kidney disease. The expectation is that passage of the bill will lead to increased funding for such research. 3When Luke gave his cousin Maggie his right kidney, he was just being Luke—kind, loving, and never taking no for an answer. He knew that there was no other alternative for Maggie, so he didn’t hesitate. Every single day, Maggie calls him and thanks him for the gift of life. But today’s call left them both troubled and sad. Luke just received a letter from his life insurance company stating that his policy had been terminated and that his application for long-term care insurance had been denied. The application revealed that he’s a living donor, and therefore in a higher risk category, so he no longer has life insurance and he can’t get the long-term care insurance he wanted. Luke told Maggie that he loves her and doesn’t regret what he did. But giving her a kidney means that he won’t be able to protect his family as he’d planned. Living donors shouldn’t be penalized for saving a life. But as the laws read now, this is completely legal. However, the Living Donor Protection Act was introduced to help prevent such discrimination by making it unlawful for insurance companies to decline, terminate, or limit coverage for living organ donors or to charge them higher premiums for life, disability, or long-term care policies. The bill further clarifies that organ donors can use the time mandated through the Family and Medical Leave Act to recover from transplant surgery. Would you like to see these bills become law? We need your help! You can share your story with members of your congressional delegation by phone, by email, or in person. Each of us is represented by a member of the House and by a Senator. These bills didn’t garner enough support in Congress to get passed in the last cycle, so all of them must be reintroduced. Call or contact your elected representatives. Say, “I want you to support the Living Donor Protection Act” (and/or the other bills). Call them again later and reiterate it. Ideally, go meet with your legislators and tell them how important these bills are. For more information and a sample letter, view RSN’s Advocacy program about Kidney disease advocacy. To help these bills become law, we need to tell our story over and over, to share this important information with our family and friends, and to ask them to share it as well. Passing these bills is the right thing to do, and if we all do our part, we will prevail. Joanna Galeas has had kidney disease since 2009, is on peritoneal dialysis and is awaiting her first kidney transplant. She is on the RSN board, serves on the Network 18 Subject Matter Expert committee and the national network coordinating working group.